Can You Find The Five Differences In The New Vikings Logo? 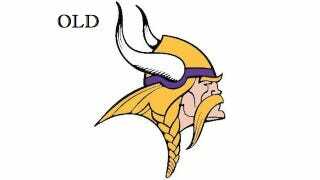 The Vikings have not "changed" or "altered" their Norseman logo, or whatever other plebeian teams do. It has been "enhanced." Play with the slider above to see both the old and new logos. At first glance, it looks almost identical. But at this morning's official unveiling, the team was adamant that the enhancements are as necessary and vital as they are subtle. Let's play count the buzzwords! The Vikings have enhanced the team's primary mark to give it a more natural and defined look... The sharper, bolder mark speaks to the direction the team is heading while still preserving the tradition of the Norseman. Fans will see from the side-by-side comparison that this is not a logo change. Rather, the enhancements simply give the mark an improved, more defined appearance. But can you actually spot the differences? There are five of them. Examine the images above to find them all. When you're done, highlight the following magic inviso-text to read about the "enhancements," straight from the Vikings' official description. The shape of the horns has been adjusted and the shading in the horns has changed. The base of the horn now resembles the horn on the players' helmets. Thicker lines have been added to the mustache and face. The Vikings Gold is now brighter and less brassy. The braid has been shortened, resulting in a reduced logo height.